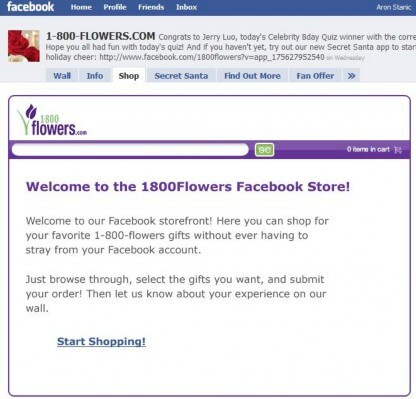 In July this year 1-800-flowers.com launched an online store inside their Facebook fan page using a solution provided by Alvenda, and have soon completed the first ever retail transaction inside Facebook. They have also distributed a huge number (a million, or so they say) of stores on Mother’s Day via Alvenda’s shoplets, but that’s an entirely new discussion topic. Let’s get back to The Social Network – and how you (or your clients) can leverage its huge popularity to generate more sales. Your customers are definitely spending way more time on Facebook that they are browsing through your store. So, how do you go about engaging them? How can you sell on (or in) Facebook? Here’s a pretty straightforward option, and you can target just about anything… if your product aims at a single 21-year-old Croatian female college student who is a fan of How I Met Your Mother and snorkeling, you can make sure your ad will show up in the right place – of course, then there’s just that small thing – will she click? And if she clicks, will she buy? This is more of a classifieds/eBay-like experience mostly for individuals, although some merchants are using it as well. Deserves to be mentioned, and that’s about it. A must for the majority of retailers. 99% of online retailers have or plan to have a fan page on Facebook so you don’t want to be the only one not playing. Fan pages, in addition to generating and raising your brand awareness, can be used for all kinds of sales promotions (with a bunch of links to product landing pages on your site). But, and of course there’s a huge but there – as any other sales and marketing effort, your fan page has to have dedicated people working on it and it needs to engage the customers on a regular basis to constantly remind them why exactly are they your fans. So here we come to the two final options which I like the most right now – and they adopt very different Facebook tactics. Many retailers have embraced Facebook Connect in an effort to combine the best of two worlds – online shopping and social networking – and enable their customers a collaborative shopping experience. This is achieved by customers logging in on a retailer’s site using their Facebook IDs – there they can view product reviews and get instant advice from family and friends in the process of making purchasing decisions. Here’s a list of some of the live sites using this API for a vast variety of purposes – maybe this can give you some ideas. While all the previous methods can help you and your customers spread the word, share your products with friends of friends’ friends, and, ultimately, increase your site traffic and total sales, only the last one, used by the famous florists from the top of the article, will allow your customers to make the actual purchase without ever having to leave Facebook, and this is where it definitely stands out. The Shop tab on their fan page brings you to the actual store – there’s no need to allow any app to access your data, there’s a selection of products you can order (although limited when compared with the actual 1800flowers.com store), and the ordering process is simple and easy, exactly like you’re buying from a merchant’s online store. However, although the checkout process is supported by VeriSign secure encryption, the one thing that could scare off some customers is the lack of that famous “https://” in the address bar (since this shoplet is actually in a form of a widget embedded in the fan page) so this will take some getting used to. And the fact that this shoplet gives you the exact same shopping experience as the 1-800-flowers site is maybe its biggest flaw at the same time. What it lacks is the social networking component – you can’t share anything about your shopping experience with your friends, set birthday or anniversary reminders (not that anyone would admit they need to be reminded of that, right, guys?) or anything similar. It’s basically a shop within Facebook with all the good and the bad things that brings along. I’ve tried getting some thoughts on this from the America’s favorite florists, but am yet to receive any reply. I’ll update the post when/if I get any feedback from them. So, what do you think? Can the portable storefronts like these Alvenda’s shoplets or other ecommerce widgets be the next big thing or are they already lagging behind by failing to recognize the importance of embedding the social networking component in the online shopping experience (something Facebook Connect is more focused on)? It’s not black or white, of course, but these are some examples of very different approaches to leveraging social networks for improving your online business. What would you rather go with – bringing customers to your store or bringing the store to your customers? Great Post Thanks. One Question for you How can increase FB Page Follower. any tips and tricks Please Share with us. I am also curious as to how to sell on facebook. Since you have just about every commenter asking how, maybe you should write a article on the details of selling on facebook. Thanks! Hallo! I make a handmade jewelrys from polymer clay but i cant sell it.I Tried on etsy and other ,but its difficult. My e-mail: xbox360360@abv.bg I hope for advice . i have a fb page advertising my handmade jewelry but i was wondering if there could be an application where i could put a shopping cart or make it easier for potential buyers? can you help? I want to sell some of my oil paintings. Can I do this on my facebook page-my personal facebook page? I make things from yarn, baby blankets and hats and scarfs! What would I needed to do first to be able to sell my stuff thru fb! Do you pay a membership price or something? I have been trying to sell my homemade jewelry on Etsy and wanted to sell on Facebook but have been told you are not allowed to sell directly from fb. Is that true? I have made a small business page on fb also but have been referring to Etsy if someone wants to buy. Problem, some people want the ease of buying right then and there and they may not want to sign up on another site just to purchase an item. The ‘ease’ at that point is lost and the customer will go elsewhere. Please advise. Thank you.